23:33:22 Retweeted @Nicole_Cliffe 23:25:14 When the Pacific Northwest earthquake destroys half the continent, we'll look back so fondly on being worried about new media properties. 05:50:43 That’s it for today’s batch of polls. One change of interest, so there will be a blog post later. 00:33:47 Trump really knows how to go for the jugular. He just destroyed Kasich. 00:46:30 Cruz attack on the questions really hit home nicely. 00:51:07 I am watching live, but with a lot of distractions, so missing bunches. Fun debate so far though. 00:56:02 Retweeted @joshgreenman 00:55:43 The story of the debate so far: Jeb Bush flat on his back. 00:57:54 Retweeted @jeffzeleny 00:55:16 The last 20 minutes is what the GOP race would look like if @realDonaldTrump and @RealBenCarson weren't in the race. 01:00:41 Hasn’t Trump been asked this bankruptcy question at every single debate? 01:01:46 Cramer gets to ask a question? Really? 01:05:19 Retweeted @RadioFreeTom 01:05:09 Becky: Mr. Trump, you had a lot of bankruptcies. 01:11:51 Seeming so far like Rubio and Cruz may rise to be closer to Trump/Carson. Bush fades further. Everybody else, whatever. 01:13:46 I gather that the embargo on AppleTV reviews dropped 13 minutes ago too based on how many of them I see in my feed. 01:16:23 Surprising lack of focus on Trump/Carson this time. Gives the others a fighting chance for once. 01:19:16 Was thinking of entering some poll results during debate, but hard to split focus. 01:22:05 . 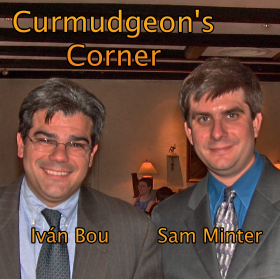 @imbou & I recorded Curmudgeon’s Corner yest, so it doesn’t include anything about tonight’s debate. I’ll probably have it out tomorrow. 01:24:19 The next monthly debate should have a 5% polling cut off instead of 1%. 01:26:59 Trump challenging moderator. A theme tonight for several candidates. Generally a crowd pleaser. 01:27:32 And media attacks more generally, as per Rubio just now… always a way to get a cheap winning line. 01:31:17 Retweeted @natsecHeather 01:31:07 Cruz follows up on Bolsheviks and Mensheviks with Star Chamber reference. I'm hoping for Council of Nicaea next. 01:34:25 Bush gets to talk again. I forgot he was here! 01:36:27 I was told there wouldn’t be math. 01:37:45 Oh Rand, Rand, Rand… once you complain about time or the rules, you have completely lost. Bub bye. 01:44:32 My guess: After this debate gets factored in only R’s over 5% in national poll average will be Trump, Carson, Rubio and Cruz. 01:47:25 Rubio & Cruz will start closing gap with Trump and Carson too I think. Trump not at his best here. Losing his mojo. :-) Carson… who knows. 01:56:53 Christie gets a good line in about fantasy football. Won’t help him. 02:00:54 Retweeted @emptywheel 02:00:35 CNBC telling us, 2 hours in, this is the REPUBLICAN debate, in case the bid to shut down all government weren't a bit tipoff. 02:14:06 Retweeted @TheFix 02:13:56 Jeb campaign may be trying to make this about CNBC. But the real story is he totally choked in a moment he needed to shine. 02:20:53 Post debate national poll avg predictions in next 2 wks -> Up: Rubio/Cruz, Flat: Trump/Carson/Fiorina, Down: Bush. Nobody else matters. 02:22:58 My over 5% group now Trump, Carson, Rubio, Cruz, Fiorina. Fiorina did well enough to not drop under 5%. Christie did well, but not enough. 02:24:50 In order to come back, Bush needs a complete reversal, and he really needed it tonight (or before). Gets harder and harder as time passes. 02:26:47 If Trump and Carson really do flare out, probably comes down to Rubio vs Cruz? Fiorina for VP? 02:28:06 But… as tempting as it is, don’t count Trump out yet… he’s got some sort of magic. :-) Carson??? I just don’t know. Don’t get him at all. 02:42:33 Retweeted @ComfortablySmug 02:41:04 CNN is now live covering CNBC's debate. Smart move dumping your audience, CNBC. A+ work over there. 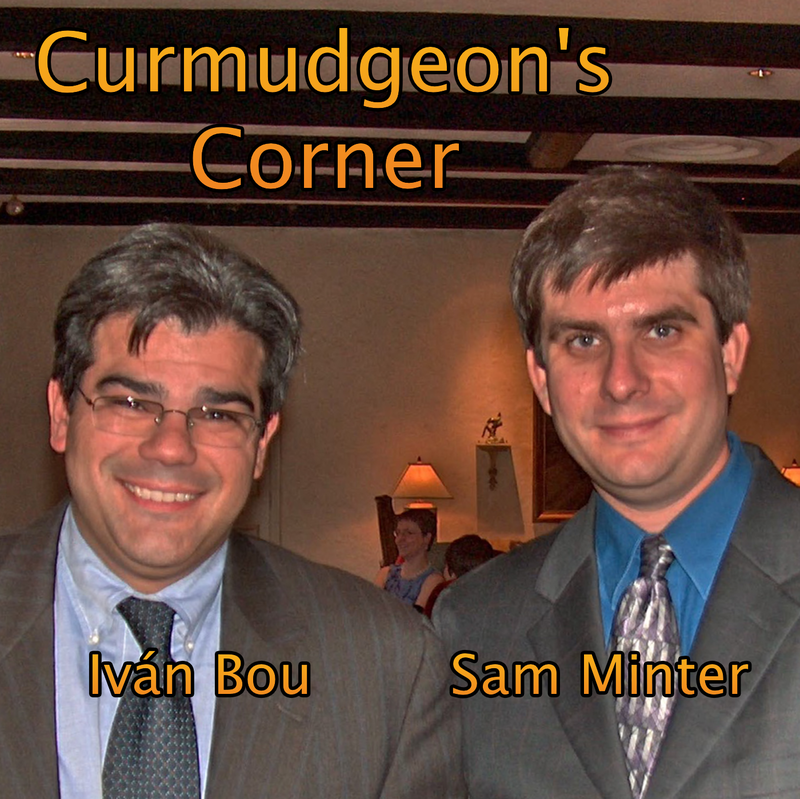 02:47:11 OK, debate long over, time to get back to putting podcast together, and maybe entering some poll data. Oh, and dinner? 02:51:30 Retweeted @BenjySarlin 02:50:51 Asked Bush campaign manager Danny Diaz about Jeb's mood after debate. "He appreciated the opportunity." 05:53:14 New @ppppolls results in NC added. Details at https://t.co/51XLs2CICt and @ElecCollPolls. One change of note, so blog post later. 18:45:03 Retweeted @MaxCRoser 17:46:09 In 1800 there was no country with a life expectancy over 40. 21:38:38 Retweeted @Snowden 14:16:28 Hearing reports EU just voted 285-281, overcoming huge pressure, to cancel all charges against me and prevent extradition. Game-changer. 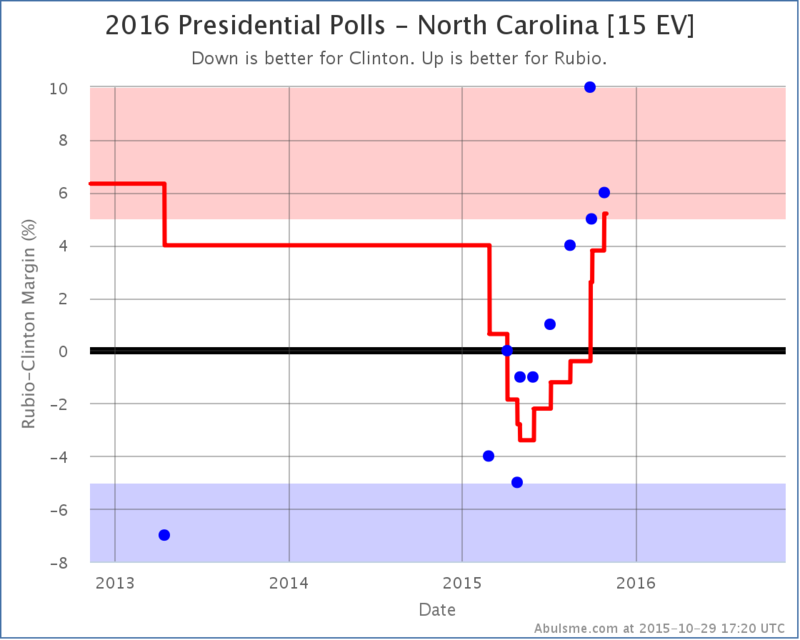 The trend toward Rubio has continued for over 5 months now. With this latest update, the poll average has Rubio with a 5.2% lead. That is enough for us to take North Carolina out of the list of states that could go either way, and just give it to Rubio. For the moment anyway. Insert here the usual reminder of just how far it is until the election and how things can change quickly. Clinton losing North Carolina from her “maybe” column makes this already close matchup look even closer. Right now Rubio does better against Clinton than any of the other “five best polled” candidates, and that race is neck and neck. 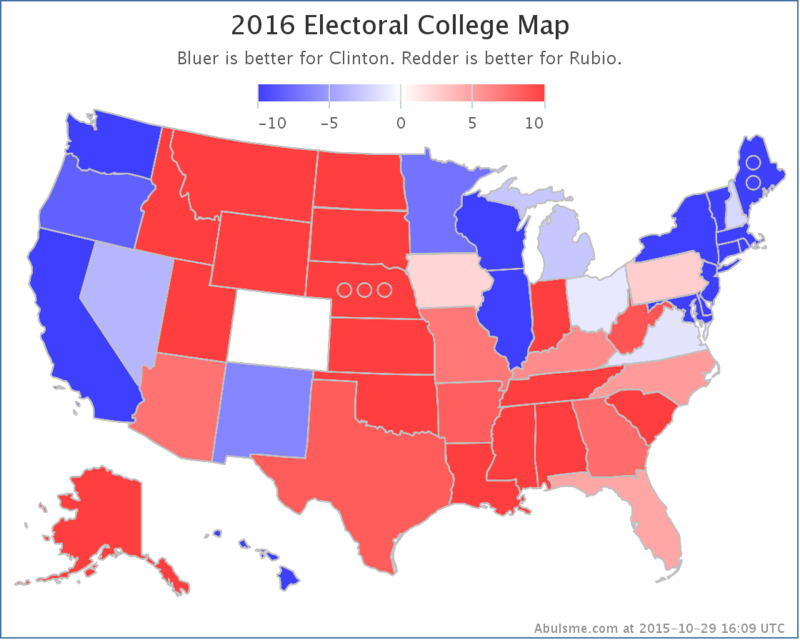 Looks like a lot more red than blue, but a lot of the red states have fewer electoral votes, which is of course why you have to look at the numbers, not just the map. Going forward, the main question is does Clinton stop her slide and start showing improved performance against Rubio and the other Republicans. With Biden out and Sanders seemingly at a plateau, Clinton can concentrate her efforts on the general election. She seems to be on a roll the last few weeks, turning around her primary poll numbers and for the first time in many months getting a lot of positive press. The unforced self-inflicted errors have not been present for a little while. This has done what it needed to amongst Democrats. I suspect that if Clinton doesn’t do anything to damage herself, and the Republicans continue as they are, we will indeed start to see some of the states that have moved away from Clinton over the past few months start drifting back. As usual though, actual events may vary. 376.1 days until the general election polls start to close. Stay tuned. 06:55:58 Retweeted @Neil_Irwin 02:41:51 "OK, you can be in the debate, but you're getting a toilet green room." 18:27:32 Just finished my ortho appointment. No surgery needed. No cast needed. Just a boot. And actually a lighter boot. Keep off foot next 6 weeks. 19:58:01 Retweeted @donttrythis 19:38:08 ICYMI here's our farewell message & sneak peek at our final season. Thank you SO much for your years of support. 22:15:33 Done catching up on polls. Thanks to @hominidviews for pointing out the Idaho poll that I hadn’t found otherwise. No blog post this time. 22:17:27 New polls in NH, WI, and ID added today. Details at https://t.co/EZdmGlTAg8 and @ElecCollPolls. No big changes, so no blog post.